When I was a little girl my mother would read us a book about holiday traditions. It told us about all of the ways that other cultures and countries celebrated. My mother’s grandfather came to America when he was a teenager. He came all the way from Italy at the age of 13, without his parents, and without his siblings. He came to work in America and eventually start a family of his own and create his own traditions. My great-grandfather was so passionate about America that he let many of his Italian traditions stay in Italy. Except for his Christmas traditions. Those he kept close. So it made sense that every year all of us grandchildren learned just as much about Old Befana as we did Santa Claus. My mother read us the Legend of Old Befana every Christmas, of an old italian woman searching for the Christ Child. I remember the book very plainly. But had not seen it in years. So I was surprised to see it in the bookstores this holiday season. Originally published in 1980 it has been reissued this year. Now I can bring it home and share it with my own children and renew the tradition that has lasted for so many generations in my family. Just like Santa, Old Befana delivers presents to the little girls and boys that have been good, and lumps of coal to those that have been bad. She uses her broom to sweep away the bad things of the year and usher in good things for the new year. 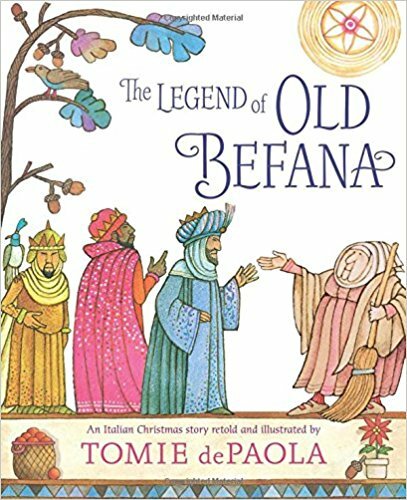 The Legend of Old Befana is a great traditional story for any Italian family, or any family looking to learn about other cultures. 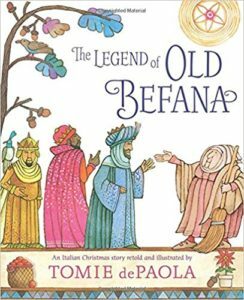 This entry was posted in Learning, reading and tagged Books, Christmas, holiday time, holiday traditions, italian holiday, italian traditions, italy, old befana, Reading, the boys store, traditions on December 1, 2017 by Lacy.